In a bowl combine the breadcrumbs and buttermilk, set aside for the crumbs to fully absorb the buttermilk. In a large bowl combine the onion, garlic, beef mince, pork mince, eggs, Worcestershire sauce, passata, salt and pepper. Combine the mince mixture, add the soaked bread crumbs and mix well. Line loaf tin with the rashers of bacon. Fill the tin with the meatloaf mixture and press into tin. Fold overhanging bacon over the top of the mince mixture, lay any additional bacon rashers on top of the meatloaf. Once the barbecue has preheated, make adjustments to the burner control(s) if required. If using a kettle barbecue add 2-3 hickory wood chunks (if desired). 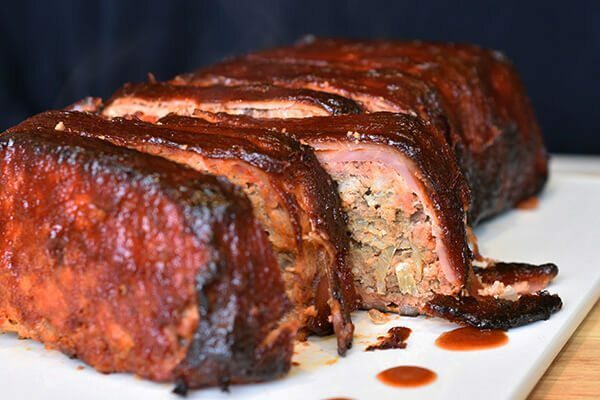 Place the meatloaf tin on the grill and cook for 45 minutes, or until the meatloaf is set and firm to touch. Using heatproof gloves, flip the meatloaf over, directly onto the grill and slide the tin off the meatloaf. Cook for a further 15 minutes, to darken the bacon. In a small bowl mix together the smokey barbecue glaze ingredients. Once the meatloaf has been cooking for 1 hour, use a brush to baste the meatloaf with the glaze. Continue to cook the meatloaf for 20-30 minutes, basting every 10 minutes. Cook until the glaze is deep in colour. To determine when the meatloaf is done, we recommend you use an internal meat thermometer. For best results, the final temperature will be 71°C. Keep in mind, once you remove the meatloaf from the heat and allow it to rest the temperature will continue to rise 5-10°C. Remove the meatloaf from the barbecue and allow it to rest for 15 minutes before slicing.